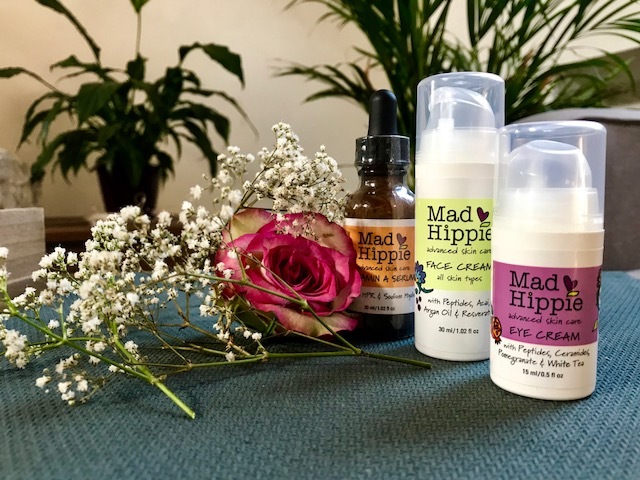 I got to know the great Vegan Organic Skin Care brand Mad Hippie by accident online. Ever since I’m using it and decided to share with you my authentic review about these awesome natural face products. 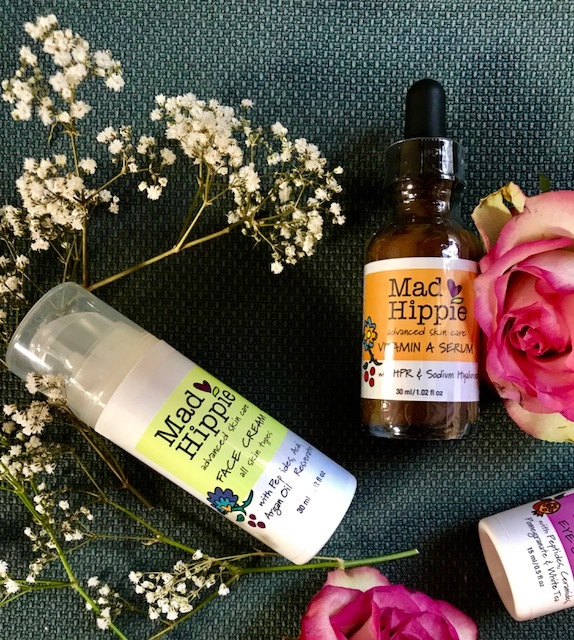 Mad Hippie is an affordable vegan skin care line that has been founded in Portland, Orego. Since then it has become a must of the skin care routine of many girls and women. Slowly but right it’s also reaching us Europeans. So the facts that make Mad Happie simpatico: The majority of the products are vegan and cruelty free. The philosophy of the company is to create skin care that doesn’t harm the environment and furthermore $1 from every sale is donated to The Wildlife Conservation Network. 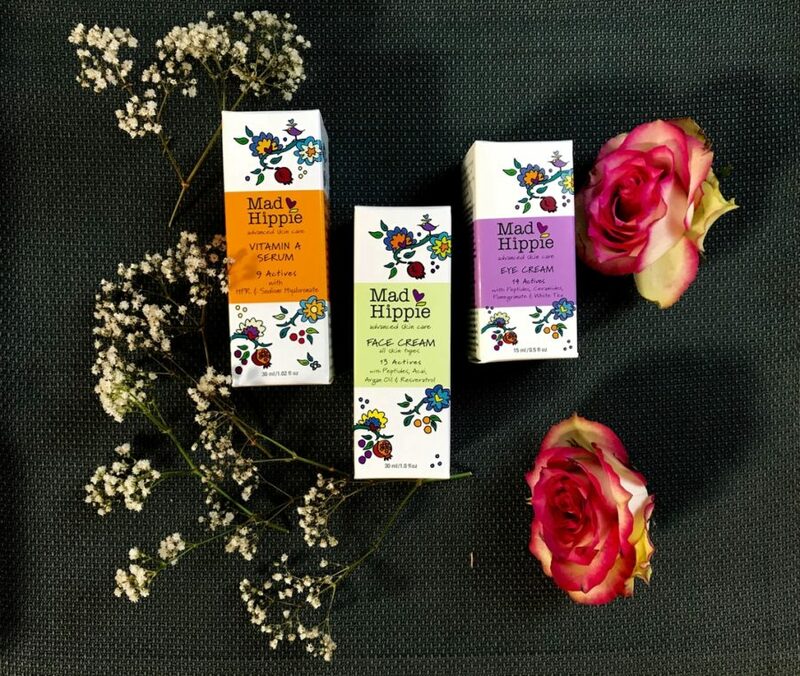 I would say Mad Hippie is not just vegan & cruelty free skin care but also a life style brand. 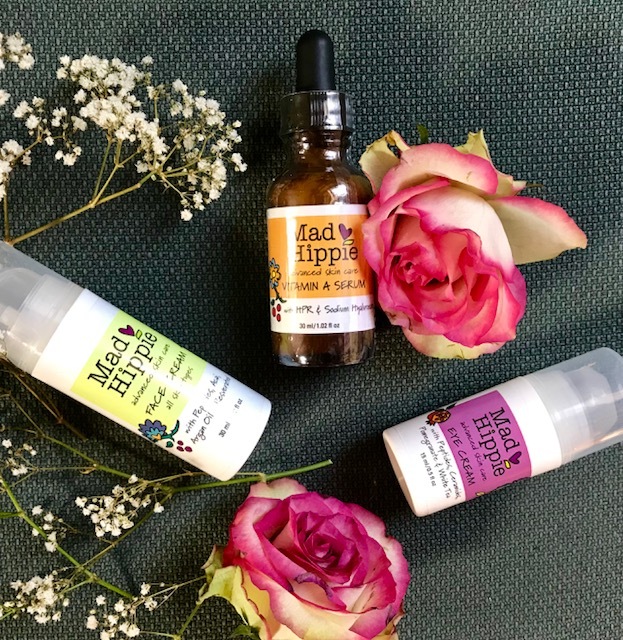 Mad Hippie also believes that the efficiency of the anti-aging creams lays in the secret of combining several ingredients and not just 1 or 2, the way many companies prefer to do nowadays. All in one after getting to know Mad Hippie’s story closer I decided to try them and see how it works. Something so delicate like our eyes needs good and efficient care. It’s also not easy to find a good eye cream that doesn’t cost a fortune. After Mad Hippie eye cream review Now I will definitely stick to this product and I will suggest it to everyone. My order arrived within a week and I didn’t hesitate to try the products. The Eye Cream has a light creamy consistency that needs a bit of time to absorb but it helps to prevent the appearance of dark circles and puffiness around the eyes. Various ingredients like Vitamine C, B3, E and white tea help to protect your skin from aging. It’s always a personal opinion if you believe in the miraculous help of anti-aging creams but Mad Hippie eye cream doubtlessly hydrates the skin around the eyes and gives the skin some fresh brightness. For those who don’t know serum should be always used in the combination with your moisturizing face cream. The goal of every serum is to stimulate skin cell function. 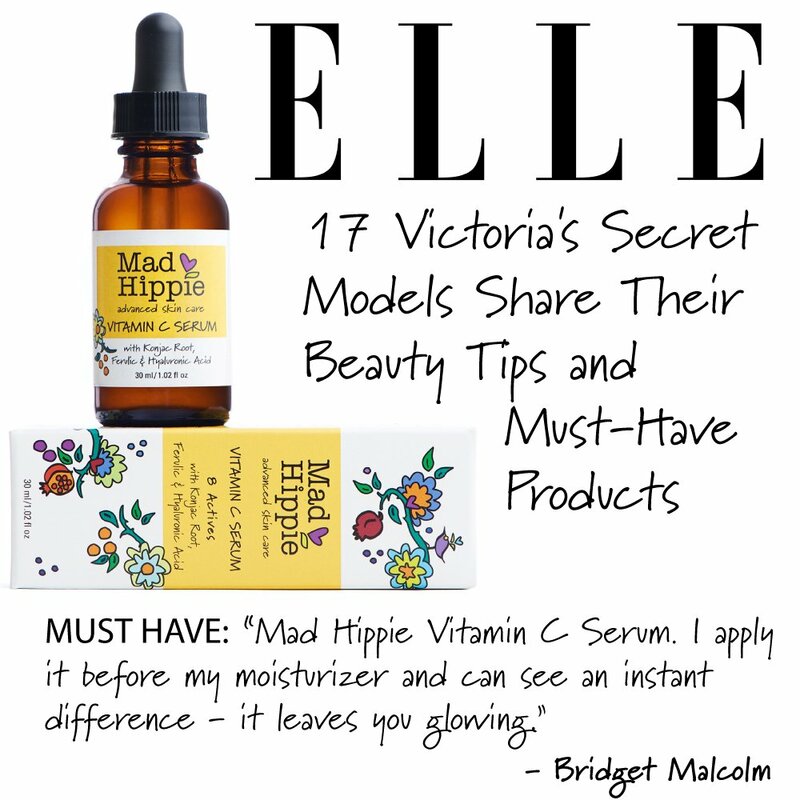 Mad Hippie Vitamine A Serum is a good mix of anti-aging highlights that help to improve, tighten and moisturize the skin. The main goals of these products are wrinkle reduction, firming, exfoliation and discoloration. In my opinion Vitamin A Serum has a bit of the “typical” smell of a natural product, it’s not bothering though. It needs to be used in the evening skin care routine 10 minutes before applying the main face cream. I could already notice the positive effects after just 2 days of using it. My skin (I have a normal type) started to look limped up, fresh and with less wrinkles around mouth and on the forehead. Nevertheless I’ve mentioned it already before I’ve been using it with Mad Hippie Face Cream. The Mad Hippie Face Cream includes 13 different actives that promise to hydrate your skin and reduce signs of aging. I like this natural face product, it has a pleasant floral scent and is easy to apply. 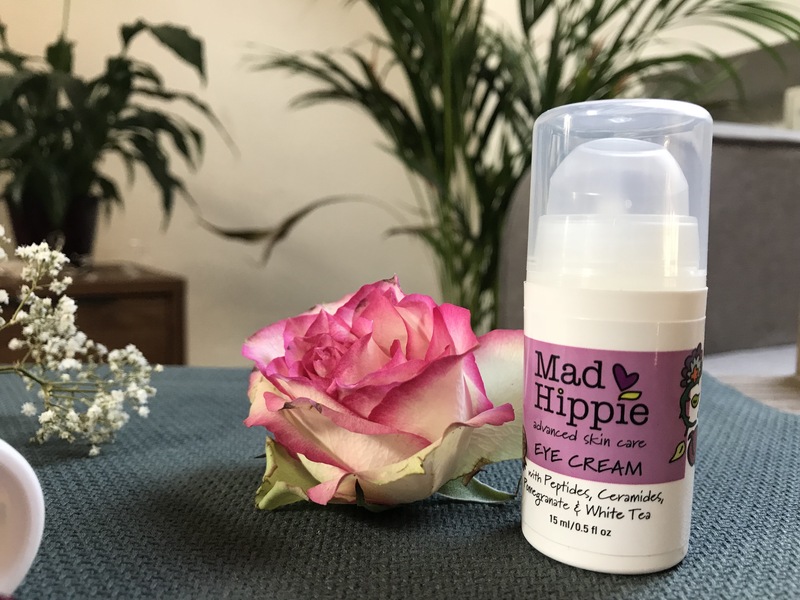 Mad Hippie Face Cream absorbs very fast and doesn’t leave any greasy feeling on your face. You need only a pearl size amount of cream to use. The after effect of the smooth skin and all-day-long hydrated skin is priceless. It says that it’s applicable to all skin types and with my normal skin type I have no issues when using it. All three products last around 3-4 months. All in one I would recommend to try it too. There are various possibilities to buy vegan and cruelty free skin care products online. You can buy it on their official Mad Hippie Website. But if you live in Europe or you would like to have it a bit cheaper it’s better to get the skin care at iHerb.com like I did. Here you can find some more interesting reviews! I’ve never heard of this brand! Love the packaging, I’ll have to check them out! I love skincare products and am totally into the natural ones. I love this line but not too crazy about the prices. It looks like the same priceline as origins. But I guess I’d have to check it out and see the difference. This is the first time I have heard about the product. I am particularly interested in the eye cream. I love that it has all natural ingredients and most of all, cruelty free. I will look for this the next time I shop. I have been losing a lot of sleep lately and it shows in my eyes now. Sounds like a nice skincare product! Love that it’s natural and cruelty-free. I am so happy to see your article. I am a vegan I always love finding vegan and cruelty friendly cosmetics. I will have to try them. They all look really good and love the fact that they are cruelty free! Would love to try the eye cream! Seems a very nice skincare product. I will refer this to my female friends. I love that these products last for 3-4 months! That’s so convenient, not to mention it helps you save as well. I am very curious about the eye cream and the face cream. I like that the eye cream has white tea, not many do! These are good prices, I’ve seen other brands who are chemical heavy at higher prices. So I’m happier to pay less money for a better product. I’ve hears so much about this product. My friends use this every time. I have to try this too. My first thought when I saw the brand name was that this was probably something out of Portland, Oregon. Then I read the post and I was right! I love the brand packaging, and am curious to give the products a try. I love supporting brands that support a good cause in return. This one’s really awesome, it’s the kind of skin care line that I wouldn’t mind trying especially since it’s all natural! Oh I just love the name of the brand. I’m always on the hunt for an eye cream so i’m going to have to check out Mad Hippie’s eye cream. Love the Vitamine C, B3, and E in it. I like to try on the eye cream too, though I think there is no Mad Hippie available yet in our country. I am a fan of skincare products, this is a good review! It’s not available in my country either 🙂 But I and my friends are ordering it online! I’ve never heard of this brand before but I like the sound of reducing puffiness around the eye! I love Mad Hippie even though I had no idea it was from Portland. Love that majority of their products are vegan and they don’t do animal-testing. It is a must-try for everyone. These sound like lovely products. I love the packaging as it’s quite eye catching. I am trying to use more natural and beauty free products so must try to get hold of some myself. I love the idea of skincare that is vegan and cruelty free whilst being affordable too! I would love to try the serum! I have sensitive skin and is picky when it comes to skin care products. Would love to try these in the future since it’s natural! I have not come across Mad Hippie products but its good to know that they have cruelty free products . I loved that Vitamin A serum and eye cream. Never heard of this brand. The fact that it’s natural and cruelty free makes it even more attractive (animal lover here!). Unfortunately, this ain’t available in India, is it? First time I am hearing of this product. I think girls should really give it a try as it is cruelty free and affordable as well. This brand is new to me. Thanks for sharing. This is my first time hearing about the Mad Hippie brand. I love that it’s all natural and cruelty free. I also love the fact that $1 from every sale is donated to The Wildlife Conservation Network. I like that these products last 3-4 months as well, at those prices that’s a really great deal! Well they get my vote just for being cruelty free. I haven’t use them but I would like to! Oh wow I love the look of this brand! The actual packaging is fab and the logo too, love that it’s cruelty free! It’s nice to read your article, I know a lot of vegan people who would be interested in this brand. I will refer it to them! I love ethical brands. They are so much better for you and the environment and no nasty inside. I really like Mad Hippie’s packagin too. There are so many new cosmetic brands coming out that I can’t keep up with them! But I like Mad Hippie because it’s cruelty-free. I am against animal cruelty. This is my first time hearing of this brand. I would love to try the Vitamin A serum. Thanks for the review! I’m gonna try this out.. I’m always looking for the best skincare products and this seems like a win! Thank you for this post. I’m definitely going to look into these products because I’ve tried several products and nothing seems to work.